I meant to post this recipe a while ago (2 months ago, in fact), but clearly life got in the way. Between work and friends and everything else, I have been so busy and have sadly neglected the blog a bit. However, I am back and have cooked a lot in the lapsed time! This means many posts to come. 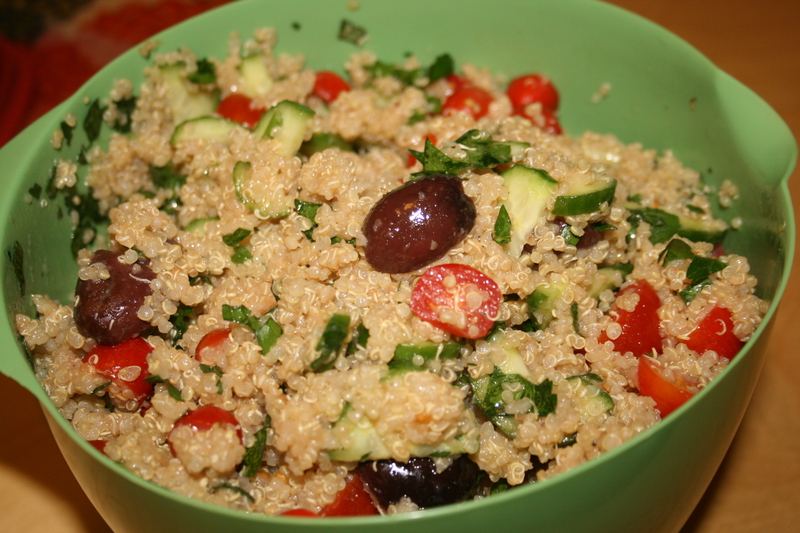 This recipe for Greek Quinoa Salad is the one I made when my girlfriends came over a few months ago for wine night. It is fresh and very herbsious, which I love. It has very fresh notes when you bite into a cucumber or tomato, and a nice tang from the calamatta olives. I highly recommend making a large batch of this: it is great to much on as a snack or bring for lunch throughout the week (and nothing is better than having lunch prepared a week in advanced when you work!). Mix all vegetables and herbs in a large bowl, set aside. In a saucepan heat over medium/high a tablespoon of olive oil add the quinoa and a little bit of each of the spices (last 6 ingredients), sautee for about a minute and add the chicken broth and fresh lemon juice. Heat on high, when it comes to a boil, crack the heat down to a simmer and cover the pot (from this point, cook according to your quinoa box’s directions). While it’s simmering whisk together 1/2 cup of olive oil and 1/4 cup of vinegar with salt and pepper (to taste). Pour the dressing over all of the vegetables and mix them together. When the quinoa is done fluff it with a fork and let cool. Mix the quinoa in with the vegetables.